Atlanta traffic is some of the worst in the country. Experts say drivers here waste 51 hours each year as a result of congestion. But time isn’t the only thing gridlocked commuters lose. Traffic delays cost Atlantans a lot of money, too — starting with higher quotes for Georgia car insurance. But which residents have it the worst? A new NerdWallet study has found Loganville and Snellville are the two worst suburbs for commuters bound for Atlanta. To determine the rankings, we analyzed the two major costs associated with commuting: time and money. 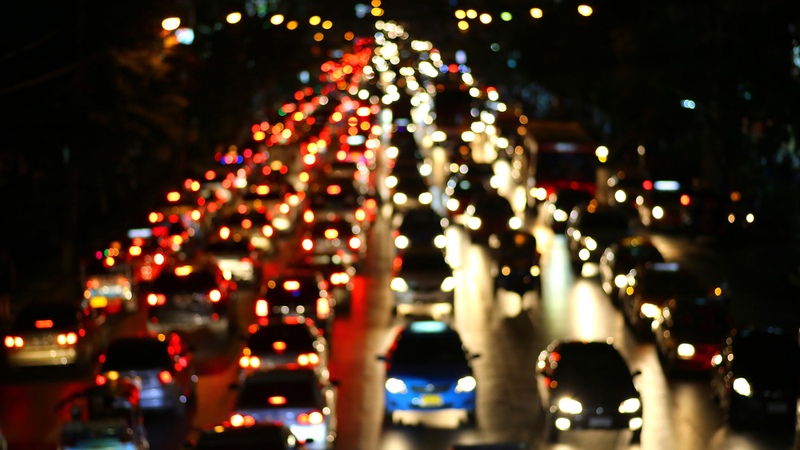 Gas and insurance are two costs that vary depending on your commute. Obviously, the more you drive, the more you spend on gas. However, gas prices fluctuate a surprising amount among Atlanta’s suburbs, with a difference of 13 cents between the highest and lowest averages. Similarly, insurance costs rise if you have a long commute. One factor that insurance companies use to determine premiums is the number of miles you drive. How expensive is gas? (15%) We looked at average gas prices in each county. How expensive is insurance? 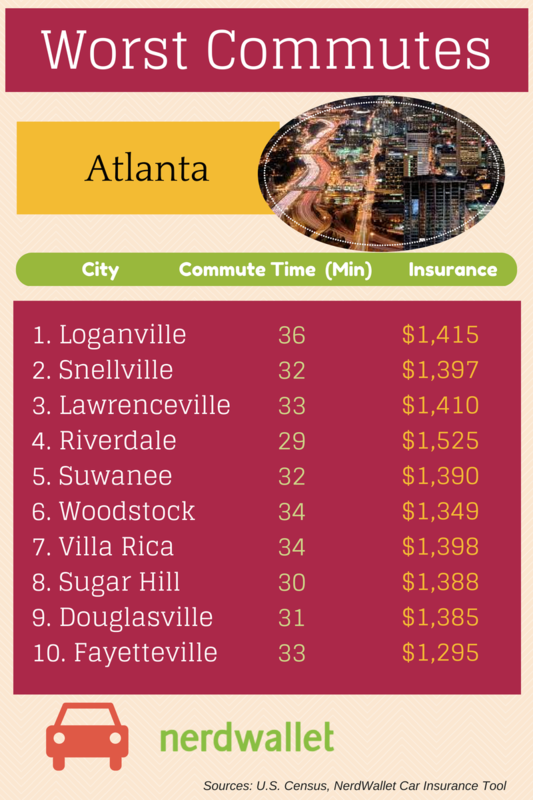 (15%) In order to accurately compare insurance costs, we calculated each suburb’s average car insurance price based on its distance from downtown Atlanta. How long are workers’ commutes? (50%) We looked at the length of the average worker’s one-way commute. The average Atlanta-area worker spends 28.74 minutes commuting each way. Loganville workers spend, on average, 36.2 minutes commuting to work each way. On average, Atlanta-area commuters pay $3.43 for a gallon of gas and $1,375.46 for car insurance each year. Five of the suburbs that made our top 10 list were in Gwinnett County. Their rankings were driven by the county’s high gas prices and long commutes. Loganville ranked as the worst suburb for commuters on our list. Located 36 miles east of Atlanta, Loganville drivers commuting to The Big Peach can take either Georgia Highway 20 and Interstate 20 or U.S. 78. The average Loganville driver commutes 36.2 minutes to work each day. Drivers in Loganville also face high gas and insurance costs. The area’s gas and insurance costs, $3.47 and $1,415.08, respectively, are higher than the other Atlanta suburbs. Snellville is about eight miles closer to Atlanta than Loganville, but it is still the second-worst suburb for commuters on our list. The average Snellville worker spends 32.3 minutes each way commuting to work. Snellville also has a high percentage of workers who drive alone to work — 81.7%, which is higher than the Atlanta-area average of 77.6%. It takes drivers about 36 minutes to get from Lawrenceville to Atlanta without traffic, but with traffic, the commute often takes more than an hour. The percentage of workers who drive alone for their commutes is slightly less than the Atlanta-area average, 75.8%. However, their commutes are longer than average, 32.8 minutes. This average includes drivers who do not commute to Atlanta. Lawrenceville drivers face relatively high gas and insurance prices. The price for a gallon of gas in Gwinnett County, where Lawrenceville is located, is $3.50. For Lawrenceville drivers commuting to Atlanta, car insurance will cost them about $35 more each year for insurance than other suburban commuters, $1,409.46. Riverdale is the closest city to Atlanta to make the top 10; it is just 12.9 miles away. On average, Riverdale workers spend 29.1 minutes each way on their commutes. The percentage of workers who drive alone to work in Riverdale is similar to the state average; 77.7% of Riverdale workers drive to work alone. Clayton County residents, where Riverdale is located, pay the most for gas in the Atlanta area. They pay $3.52 per gallon, which is almost 10 cents more per gallon than average. In addition to high gas costs, Riverdale residents face high car insurance rates. A Riverdale driver commuting to Atlanta can expect to pay about $1,500 for car insurance annually. Suwanee is located in Gwinnett County, and according to the Census, only 57.9% of workers in Gwinnett County live and work in the same area—the rest leave the county. The average worker in Suwannee spends 31.8 minutes commuting each way in traffic. Woodstock is the only place in Cherokee County to make the list. According to the census, only 41.6% of Cherokee County workers live and work in the same area. Woodstock workers in particular can expect to spend 33.7 minutes commuting to work each way on average. Villa Rica is about 30 miles west of Atlanta. The average Villa Rica worker spends 34 minutes each way commuting, which is 18% more than the Atlanta area average of 28.74 minutes. Drivers in Villa Rica face reasonable gas and insurance costs. Villa Rica is in both Carroll and Douglas counties, and the average gas price of the two counties is $3.43, which is the same as the state average. Insurance for drivers commuting to Atlanta is also similar to the state average — just $1,397.67 each year. Sugar Hill is the place farthest from Atlanta to make the list. The suburb is nearly 40 miles northeast of Atlanta, and without traffic, it takes about 40 minutes to get to the city. However, with traffic, the trip can be well over an hour. 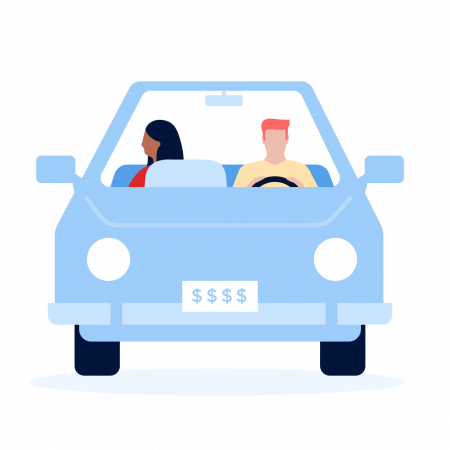 Sugar Hill drivers pay slightly more for car insurance than the Atlanta-area average, $1,388.42 each year, and significantly more for gas at $3.50 per gallon. That’s compared to an average of $1,375.46 each year and $3.43 per gallon, respectively. The average commute for Douglasville workers is 30.9 minutes, which is about two minutes longer than the Atlanta-area average. Douglasville sits about 20 miles west of Atlanta, and commuters must take I-20 for their commute. Of all Douglasville workers, 83.4% drive to work alone. Fayetteville is about 20 miles directly south of Atlanta. On average, it takes Fayetteville workers 33.1 minutes to get to work, and 84.1% of workers drive alone to work. Gas and insurance costs in Fayetteville are on par with other Atlanta suburbs. A gallon of gas in Fayetteville costs $3.43, which is the same as the area’s average. Average car insurance for Fayetteville workers who commute to Atlanta is less than the area’s average — $1,294.63 compared to $1,375.46 for a 2012 Toyota Camry. 1. Mean travel time to work from the 2012 U.S. Census Bureau American Community Survey. 2. Percentage of workers commuting alone by car from the 2012 U.S. Census Bureau American Community Survey. 3. Average gas price by county from Gas Buddy. 4. Average car insurance rates based on each suburb’s distance from Atlanta for a 2012 Toyota Camry from NerdWallet’s Car insurance Comparison Tool.